it output the value that you assigned. then Request scope and stop when find it. true denotes the output value will be encoded to prevent XSS (Cross-site scripting) attack. false denotes just output what you assign. 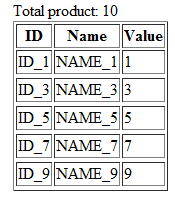 usage: Output this default value if can not find the value you assigned. or put the attribute into the scope you assigned. if the scope is not assigned, it will remove the attribute from every scope. 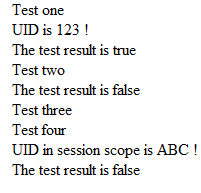 The if tag test a condition, insert its body content into page if the condition is true. you can change the scope by specify the 'scope' attribute. but the 'productList' member is not required. The getter is the only thing it depends on. the varStatus is the status of iteration.